I spent the last two months in the Occupied Palestinian Territories diligently looking for trouble. Strangely, despite my best efforts, I didn’t manage to find any. I spent every Friday during Ramadan in the vicinity of Haram Sharif in the Old City, poised and ready for rock throwing and riots. There was some rock throwing and rioting at that very location, but I was never there when it happened. The one day they really decided to have a riot, I was home in Abu Dis, grading final exams for my political philosophy class. Another tense Friday evening at Jaffa Gate. According to the pro-Israeli blogger Elder of Ziyon, the Jerusalem light rail system is pelted with rocks by Palestinian youth “every single day.” I was in Jerusalem in the vicinity of the light rail twenty of the sixty or so days I was in the area, and didn’t see it get pelted even once. Didn’t hear of it being pelted once, either–and I had a friend in Shu’afat (the neighborhood, not the refugee camp) who rode it without incident every day for a month. Didn’t see any broken windows, any terrified commuters, or experience any anxiety while hanging around the rail stops at Jaffa Road and near Damascus Gate. Just saw the light rail making its way from Mt. Herzl to Pisgat Zeev and back, over and over without incident. As I’ve mentioned before, there was a stabbing at Damascus Gate one morning. 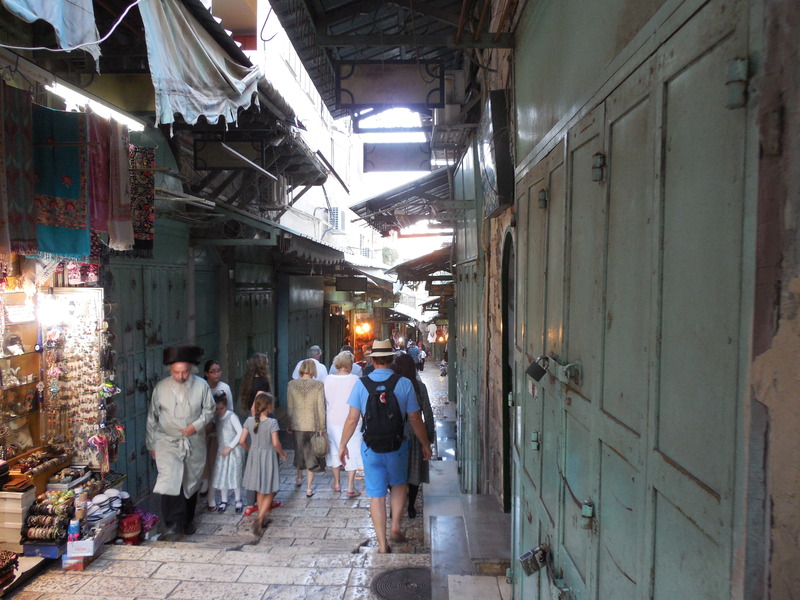 I had planned to be at Damascus Gate that very morning, but got sidetracked by some paperwork that needed to get done, and never made it there. The stabbing took place without me. On my way back from a visit to Hebron, my guide and I drove by clashes-that-were-about-to-take-place at this highly contested location near Al Arroub Refugee Camp. As we drove by, the Israeli soldiers were loading their weapons and the protesters were getting ready to engage. “I don’t think we should stop,” my guide said. So we didn’t. I went through about thirty checkpoints. It was often a tedious and demoralizing experience, but it was mostly uneventful. No rock throwing, no terrorist attacks, no beatings. Only one arrest. That’s not to say that there were no checkpoint incidents while I was there. I just didn’t happen to be around for any. I went out to dinner with friends in Azariah immediately after the Duma attack. One friend floated the idea of driving to Jericho for dinner. “Maybe some other time,” said the other friend. Unsurprisingly, all hell broke loose that night across the West Bank. But things were calm enough in Azariah. We had a nice chicken dinner. While in Abu Dis, I made contact with Daniel Luria of Ateret Cohanim, who invited me to tour the “Temple Mount” (Haram Sharif) with his group (Luria: “We don’t often get inquiries from Abu Dis”). Ateret Cohanim is a settler organization, and settlers who visit the Temple Mount/Haram Sharif are usually subject to harassment by Muslims who object to their presence there. I was all set to go, but had to cancel at the last minute because of a scheduling problem (once again, believe it or not, my plans to visit the holy site were trumped by the holier imperative of grading). On my last day in Abu Dis, there were violent clashes between locals and the Israel Defense Forces. I heard the clashes from my window and decided to go out into the city to find them. Following my nose (tear gas) and ears (stun grenades) I set out in (what I took to be) the direction of the clashes. I spent an hour looking for trouble, but didn’t really manage to find it. When I finally got to the relevant location, all I found was an abandoned street where clashes had taken place, the residue of tear gas in the air, and a couple of still-burning fires. Last time I went to Israel, I was detained for five hours on entry at Ben Gurion Airport, and for four hours on exit. This time, I was only detained for about two hours on entry, and for about half an hour on exit. In an attempt to be polite, the lady who gave me my exit permit gave it to me and tried to say, “You’re free to go.” What she actually ended up saying was, “Please go.” I didn’t know how to respond, so I said, “OK,” and left without incident. Terror from the Midwestern skies. So I got home to New Jersey, rested a day, and flew to Michigan to spend some time with Kate Herrick. On Thursday, Kate and I decided to go to the Ingham County Fair for some good, wholesome Midwestern fun. After eating some really unwholesome county fair food (“jalapeno poppers“), we decided to ride “The Zipper,” a vicious amusement park ride characteristic of Midwestern county fairs. Though strapped in at the waist, I didn’t realize that I was supposed to keep my arms outstretched in front of me to keep my head from being bashed against the steel sides of the car. Predictably, my head got bashed against the steel sides of the car, and I ended up in the ER with a concussion. Aside from some headaches, cranial pressure, drowsiness, and mild loss of memory and cognitive function, I’m OK.
For months, people have asked me whether travel to the Mideast is “safe.” I rest my case. If you want danger, try the Midwest. Yeah, yeah, I know: “safe travels.” Spare me. Postscript: As Rod Stewart once put it, some guys have all the luck. Some guys do nothing but complain. This entry was tagged travel blogging. Bookmark the permalink. Woah, Depeche Mode’s “Policy of Truth” started playing on my Spotify as I was reading this post. I’m finding Pine Ridge alternately puzzling, breathtaking, and depressing–and that’s just after a day and a half. I may or may not have time to blog while here, but will do so once I get home. Of course, the minute I get home, I have jury duty, so I may have to blog that, too. I’m curious what you mean by “despicable.” Not disagreeing, just trying to figure out what to look for in a week’s stay. By “despicable” I mean the stark contrast in poverty between Reservations and the rest of the country, and the segregation.